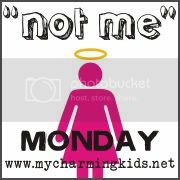 Not me Monday is a fun way to confess your little imperfections of the week! This comes from a really cute mom blog McKmama. 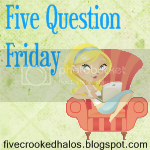 Check her blog out it is really funny! This should be fun! I did NOT turn the baby monitor down and let the Blond One scream in her crib (for who knows how long) and go back to sleep, only to finally go check on her and find a huge diaper full of diarrhea and a VERY RED bottom and vajayjay. NOT ME, I would NEVER do that. There is NO way I would EVER let the Red Head and the Brunette eat Happy Meals TWO days in a row....NEVER EVER, not me! Because I am trying to lose the last 10 lbs of my baby weight, I most certainly did not eat chips and queso THREE days in a row. I am much to dedicated to my weight loss plan. NOT ME. Finally, I would never NOT WASH my hair and run a blow dryer through dirty hair to try and spruce it up a little and not look quite so greasy. How gross would that be...NOT ME!!!! So happy I am not the only one who has NOT done any of those things too. Visiting from MckMama's. Happy not me Monday!! Sounds like a rough week! Hope blondies bumper is feeling better. I hate when this happens, you tell yourself that your sleep is more important than their crying and then they leave a big pile of guilt in their diaper for you! Her bum is much better today!! YES, the big pile of guilt!! i have done the happy meal thing twice in a row too. glad to hear the little one's bum is much better. Fun post. Thanks for stopping by my blog earlier. Love the title of your blog! Cute!